The folk scene seems to be largely switched on to the fact that engaging with kids and getting them involved early is important. This is neither startling news, nor is it in any way new news. If anything it borders on the screamingly self-evident. It’s worth dwelling on for a while, nonetheless. Festivals have for years been at least incorporating youth elements into their programs, or holding self-contained and separate kids’ festivals, sometimes devoting a discrete area specifically for the kiddies. Woodford boasts a kids’ program that’s as extensive and packed as some whole festivals. I’ll spare you, dear reader, from further personal insights and observations on topic. Much more illuminating (and hopefully, more interesting) are the experiences and motivations of younger performers and the adults who help nurture the burgeoning young talents. I’ve had the chance to broach the topic with a handful of pint-sized performers and their support staff (typically labelled ‘Mum’ and/or ‘Dad’) and hope to bring a few of their stories into print from time to time. The Bond Traps come in all shapes, sizes and ages, but their two centre-pieces have only just turned 11 years old. Ellena and Isabelle Bond grew up immersed in the music of their father Luke, and the singing of German nursery rhymes by their mother Beata. Luke is guitarist and singer with the Bond Traps and had himself grown up in a musical family, was classically trained and played in bands, then turned his hand to home-growing his music and nurturing the talents of his twin daughters. The rest of the Bond Traps are a wee bit older. Tim Snowdon is an artist who was painting the Bonds’ house (that was with a roller, not water colours, by the by), so the natural progression from there was playing bass with his clients’ band. Ben Phillips is an ex-colleague of Luke’s, and he ran into the Bonds one night while getting a pizza after the family had been performing, and from there Ben was cast as fiddle player. Their music is a blend of bush ballads, Australian folk, and American blue country, drawing inspiration from the country around them, their farm life, and whatever takes their fancy. A stand of bamboo growing in the backyard, for example. Both the girls sing. Ellena plays accordion and recorder while Isabelle plays percussion, recorder and harmonica. There’s something inspiring about watching a child play any instrument, but it’s another thing again to watch someone barely in double figures mastering a piano accordion: the musical equivalent of patting your head, rubbing your stomach and simultaneously compressing and reinflating several kilos of ballast strapped around your neck. Having played around Bungendore and Queanbeyan for some time, the girls were having their second crack at the kids’ competition at Majors Creek, with the prize of tickets to the National providing more than enough incentive. The Bond Traps were ultimately joint winners of the competition and performed in the youth competition at the National in March where they were worthy competitors. For all of the focus on practice, performance and the element of competition, it’s always refreshing to see kids just want to be kids. As Luke and I talked about weightier matters to do with music immersion, motivation and other arm-chair pseudo-psycho-musicology, Isabelle and Ellena excuse themselves for a while to go muck about on the nearby swings, returning later to give their own insights on their music. I remark on one of the songs they performed (‘Bamboo’), and how Ellena had casually introduced the performance by saying, ‘I wrote this a few years ago’. Pause while the interviewer quickly composes himself, driving away images of Suzuki-method training for very young singers, and a toddler in nappies scratching out notes and lyrics on an Etch-A-Sketch. Earlier, while the swings had proven more inviting to the girls than speaking into an MP3 recorder, I’d asked Luke where the kids got inspired to write songs. Was it spontaneous or was there some parental urging? Does it ever become a chore for the girls? Is it something that you or they feel they have to do? “They always have the option to pull the pin if they don’t want to do it, but they’re always keen to go on. What is it about singing and performing that the girls like? And what of the difference between singing one of Dad’s songs and one they’ve written themselves? The Bond Traps have taken their music a step further now and their debut album “Out There” is, well, it’s out there now. If you’re within striking distance of the Bungendore Bowling Club on Saturday 26 July, you can catch the album launch. The Bond Traps will be playing with The Fuelers. 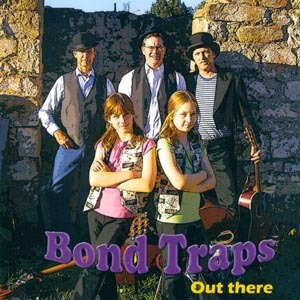 For more details, contact Luke Bond on 0409 440 619 or click on to http://www.myspace.com/bondtraps. More kids in folk in a couple of months’ time. ← A Punter’s Perspective 10 — It’s only words and that is all…. damn, what’s the next line?